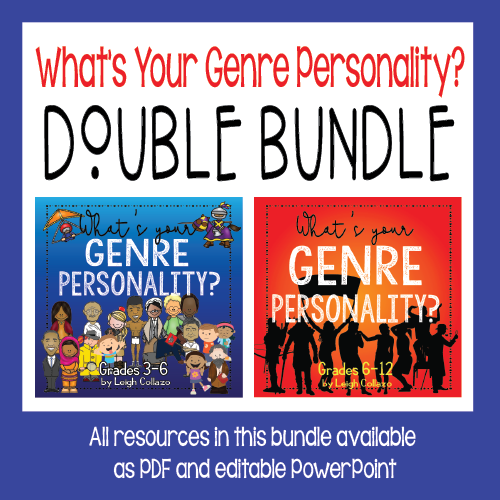 Based just on my own classes, the History Buff Genre Personality is the smallest group for students. 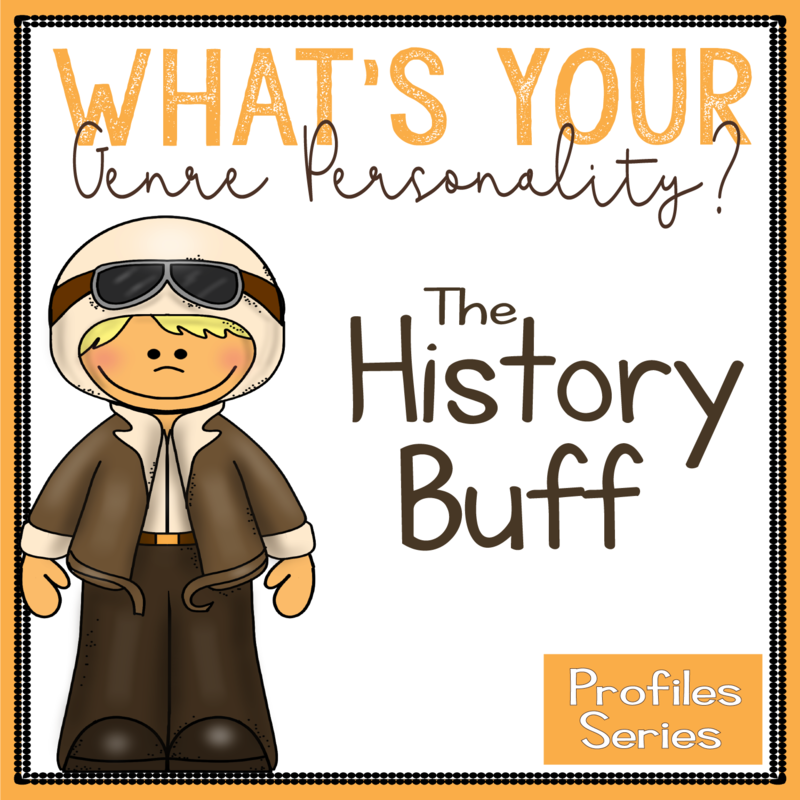 I tend to only have two or three History Buffs in each class, a far cry from my Innovators, Realists, and Thrill-Seekers. Teachers, however, tend to be strong as History Buffs. How interesting! Addison was a quiet girl who does well in school. Addy was one of those students who got easily overlooked in school. She wasn't involved in sports, she never got into trouble, she did well in school without standing out, and she wasn't really a popular student. I only ever see her with one friend, also a quiet young lady who loves to read. If it weren't for Addison, I don't think our Dear America series would ever get checked out. She has told me that she used to read the American Girls series in elementary school. By the time Addison got into eighth grade, she had gotten hooked on books like The Winner's Curse and And I Darken. John is a popular boy who is smart and a stand-out basketball player. He is one of those students who is an "All-American" type. He is well-liked by teachers and students, and he stays out of trouble. His dating relationships tend to last for months, but there are always more girls waiting in the wings when one of his relationships ends. Though John is low-drama, he tends to date girls who are high-drama and mouthy, something I imagine he will grow out of as he gets older. John frequently seeks out fiction and nonfiction books about Pearl Harbor, WWI and WWII, and Vietnam. It seems I never have enough books on these topics for John; he is voracious for them. I ordered Chris Lynch's Vietnam series specifically because I knew John would love them. And he did! 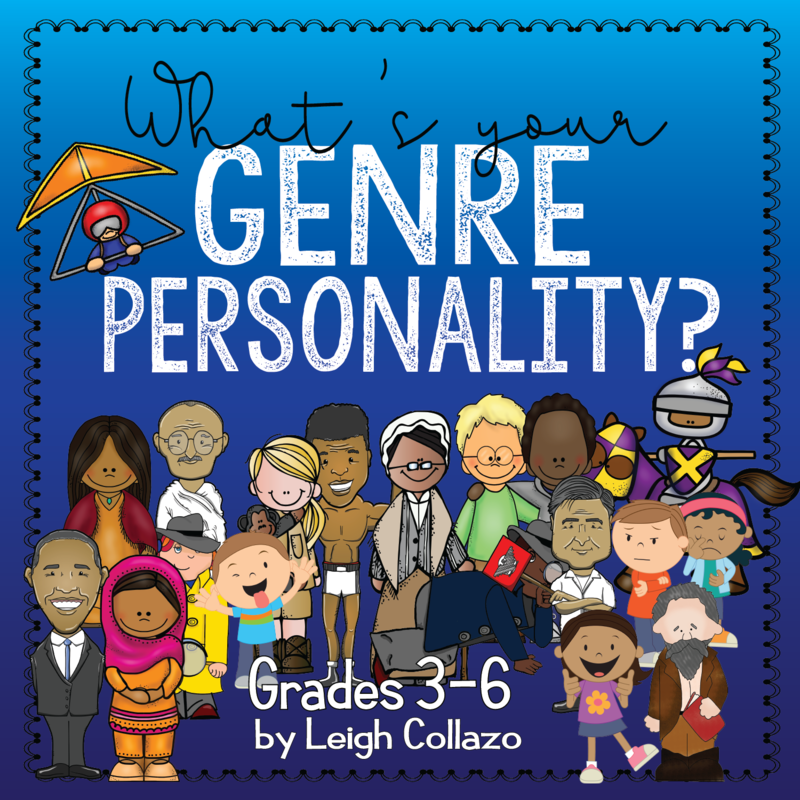 I mentioned that lots of teachers take this quiz and find out they fall into the History Buff genre personality. Ms. Bellman, Ms. Row, and Mr. 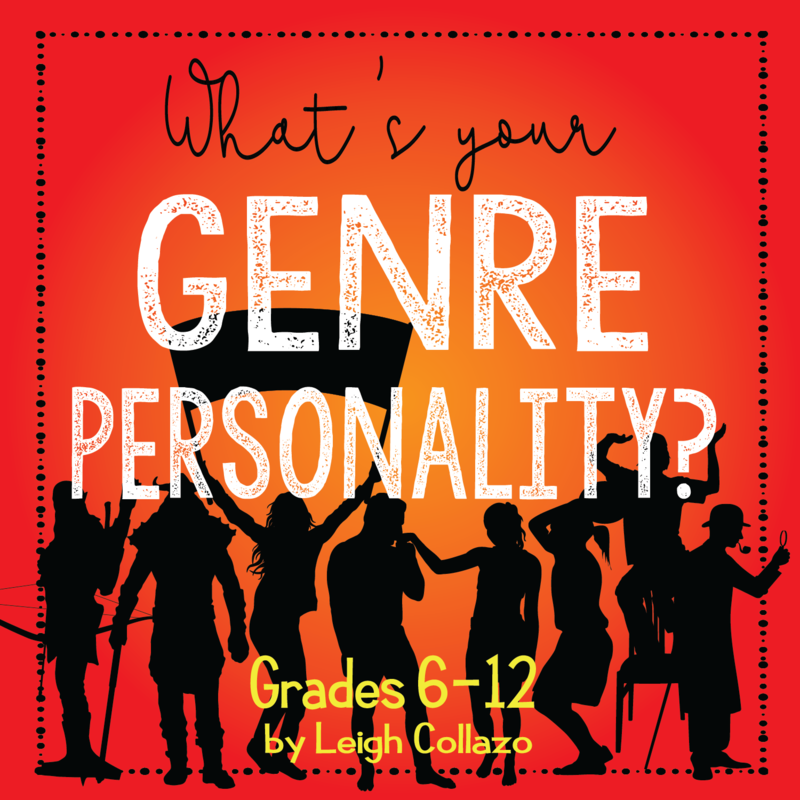 Speaks are three teachers who took the Genre Personality quiz and scored high as History Buffs. One teaches English, one teaches art, and one teaches technology classes. Ms. Bellman loves historical romances like The Outlander series and Lonesome Dove. Ms. Row especially loves books like The War That Saved My Life, The Boy on the Wooden Box, and Stella By Starlight. Mr. Speaks is one of my few male teacher readers (why on earth is that? ), and he loves reading essays, memoirs, and classics about political situations around the world. He's also a big fan of Holocaust nonfiction and spy thrillers for adults. 1. Trust them to select titles they are ready for and to return titles they are not ready for. Like Innovators, History Buffs may want to read about topics that the adults in their lives think they are not ready to hear about. Topics like The Holocaust, the horrors of slavery, and shameful actions by government leaders are especially interesting to History Buffs. If they are looking for a particular topic in the school library--even if it is a terrible time in history--they already know at least a little about that topic. Adults really need to discuss these topics with their History Buffs. Ignoring these discussions, hoping they will go away, or worse, forbidding a child from reading about them will only lead History Buffs to draw their own conclusions about unsavory historical events. Yes, it's uncomfortable and difficult to try to explain The Holocaust to a young person. No, I don't understand how the USA could have put so many Japanese and Japanese-Americans in internment camps during WWII. We as adults don't understand how it could happen, either. Instead of forbidding your History Buff from reading about unsavory historical events, try to understand why they are so interested in these topics. If you have a History Buff in your life, they may be reading about certain topics because they are also trying to make sense of it. History is full of ugly, awful things, but forbidding your child from reading about them will only make these topics more fascinating to them. Instead, research the events yourself and talk about them with your History Buff. Help them see what led up to these events and how they were allowed to occur. We can learn much from our violent past, but we have to first know about it. 2. Help them connect historical events to current events. They say that if we do not understand our history, we are doomed to repeat it. I look around at our current political and social environment in the USA, and I would say that we are already repeating it. Or maybe it never really went away at all. Today's headlines are full of stories about racism, violence against minorities, government overreach, and whispers of war. I'm from Texas, and I know people who truly think Texas would be better off succeeding from the USA. And don't even think about reading the comments in a Yahoo article about the rights of transgender people, police violence against African-Americans, or attempts to "build a wall" between the USA and Mexico. We have come a long way, but our work isn't nearly done. The more History Buffs read about our violent history, the more likely we may one day be able to say that those events truly are history. 3. Take them to places where history comes alive! 4. Use the correct terminology. This tip is for everyone, History Buff or not. Please, please take some time to learn the correct terminology for marginalized groups. Some will call this "politically-correct nonsense," but these terms have changed over time because they were incorrect and offensive to begin with. Using incorrect terminology makes you sound ignorant at best and offensive at worst. Native Americans are not "Indians." Police officers can be male or female and as a group, should not be called "policemen" anymore. Transgender people are not "trannies," people with intellectual disabilities are not "retards," and gay men are not "fags." And please, do not ever use the N-word in any circumstances. For parents and teachers of History Buffs, it is absolutely critical that we use correct terminology when referring to marginalized groups throughout history. Because they read about history, History Buffs will encounter derogatory, racist terms in their readings. These terms will never die out if we as parents and teachers do not call them out as offensive and unacceptable. And if we use the terms ourselves, our children may also grow up thinking they are okay.